SNL Alumni Bill Hader is a master of impersonations known for portraying outrageous characters like club-hopping “Stefon.” In Trainwreck (2015), he was nominated for a Critics Choice Awards Best Actor in a Comedy. The guy is versatile. But you wouldn’t necessarily call him “dark”. Enter the HBO series Barry, created by Alec Berg (Seinfeld, Silicon Valley) and Bill Hader. In it, Hader is Barry Berkman, a former US Marine — now a cold-blooded hitman. His assignments are delivered by Monroe Fuches (Stephen Root of Office Space, Dodgeball) and Barry carries them all out professionally and methodically. And these guys are raking in the cash. When the pair is asked to dispatch gym owner and aspiring actor Ryan Madison (Tyler Jacob Moore) for having an affair with the wife of Chechen mob boss Goren Pazar (Glenn Fleshler of The Good Wife, Elementary) living in LA, things go off track. This new target also turns out to be an aspiring actor enrolled in a local theater class. Barry sneaks into a session and is called onto stage to participate in a skit opposite Madison. Despite a terrible performance, Barry catches the acting bug. Henry Winkler (Arrested Development) plays acting coach “Gene Cousineau,” who begrudgingly accepts Barry into his class once they agree on up-front fee payments with no refunds. Other contributors to the series include a police detective (Janice Moss) who is assigned to investigate one of the killings, two ex-marines who force themselves into a major hit, a cutthroat Chechen gang and a self-indulgent acting classmate whom Barry falls for (Sarah Goldberg, from The Dark Knight Rises). Be forewarned that while this show is humorous, it also has a disturbing dark side. It is often jarringly and unexpectedly violent with a healthy dose of strong language. 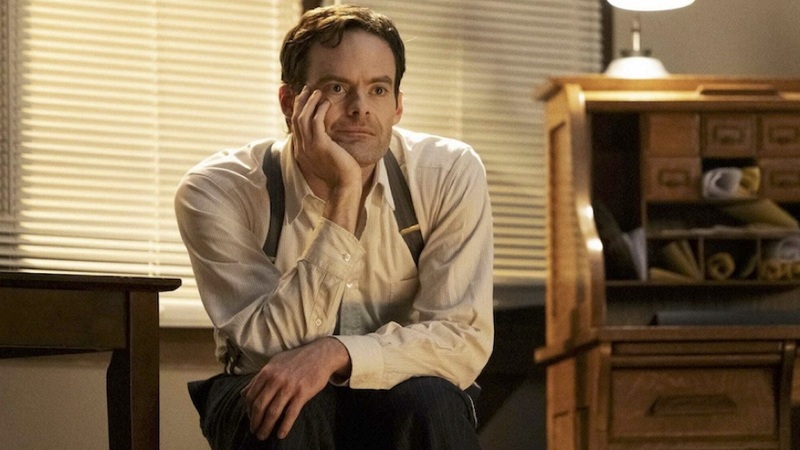 Hader is both likable — and repulsive. He also shows remarkable subtlety as he struggles with the impact his violence is having on otherwise innocent people. At the same time, Hader’s comic timing perfectly accentuates the absurdity of his situation. And mind you, he also has to portray a terrible student actor. A particular standout is Henry Winkler’s character Cousineau, the acting class coach. Cousineau also has a slimy side, but he appears to be a good guy. There’s no question that he has acting chops. He both encourages and berates his students, especially Barry, about chewing up a scene and showing real emotion. He requires that they clap for him at the onset of each class as he enters the room. Cousineau constantly name-drops but can’t land a role as “last man standing in line” in an audition for a TV commercial. And most entertainingly, Winkler repeatedly rants at Barry’s poor acting efforts, but all Barry hears is suggestions that apply to his life troubles. The series moves along quickly and unexpectedly and is highly addictive. Hader and Berg wrote the first two and last shows, and Hader directs the first three shows to make sure the desired style kicks off the series. The season ends with yet another unexpected turn (read character loss) that will send the show in a different direction in its second season (which just launched). In the clutter of new series from various streaming and cable providers, Barry lays out a formula that will keep you affixed, all while you’re chuckling and clutching your chest. The new season just kicked off on March 31, so you may want to do a little binge-watch catch up.